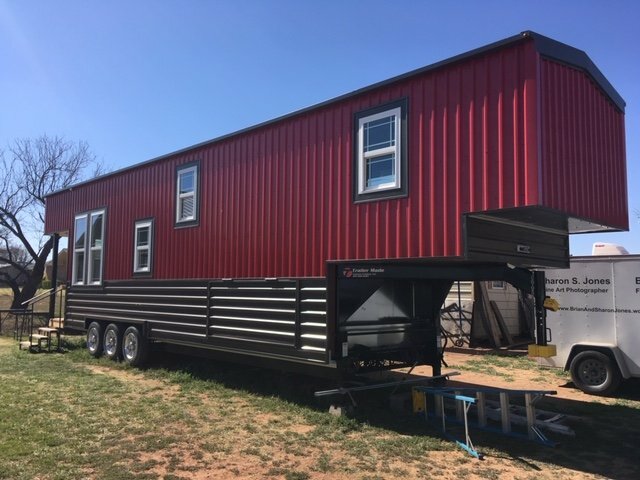 You are here: Home / RV Lifestyle / This Adventure-Bound Big DIY RV Has Tiny House Quality and More! 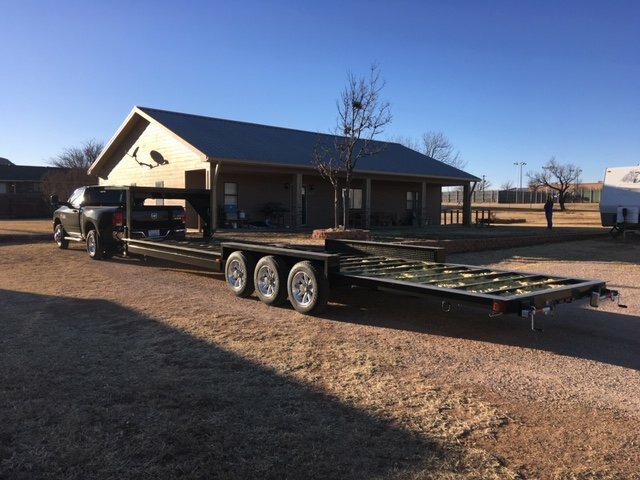 If you asked Brian and Sharon Jones “What’s the best rig for full-time living?” they will probably quip “The one you make yourself, of course!” This Texas couple knows. Their adventure-bound big DIY RV has all the best quality features of a well-made tiny house or high end RV. But it has a price tag that’s thousands of dollars less. The exterior is done. Now for the inside! “I think our home is unique in the tiny home world and the RV world,” says Brian, 45. He and his wife Sharon, 49, have seen enough RVs through the years to back up their confidence. 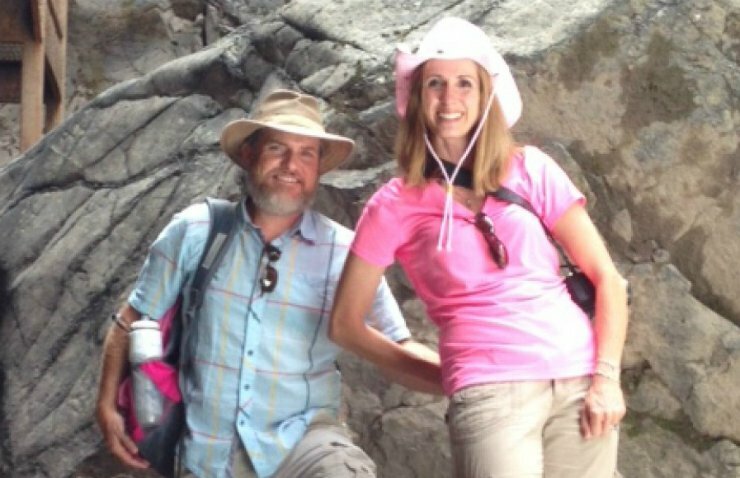 They hit the road in 2012 when Sharon put her nursing job aside to follow a passion for photography and Brian stopped driving truck to write his first full-length novel, Indian Paintbrush. After workamping around the west and falling in love with the nomad life, they embarked on their homemade RV project after a disappointing search for second full-timing rig. The trailer it was built atop. “Our 2007 Jayco travel trailer was in good shape but with no end to this lifestyle in site for us, we decided we needed something more durable that would withstand thousands of miles possibly for the next 20 to 30 years and beyond. If decide not to travel, we wanted to have a real home we could park,” says Brian. Unfortunately, even the best quality RVs with reputations as a full-time RV rig couldn’t match their expectations of what a home on wheels should be like. Disappointed with what $100,000 would get them, they decided to invest time, money and construction skills into building their dream home. Features a maintenance-free metal exterior. Now, their one-of-a-kind big DIY RV design is chronicled at their blog. 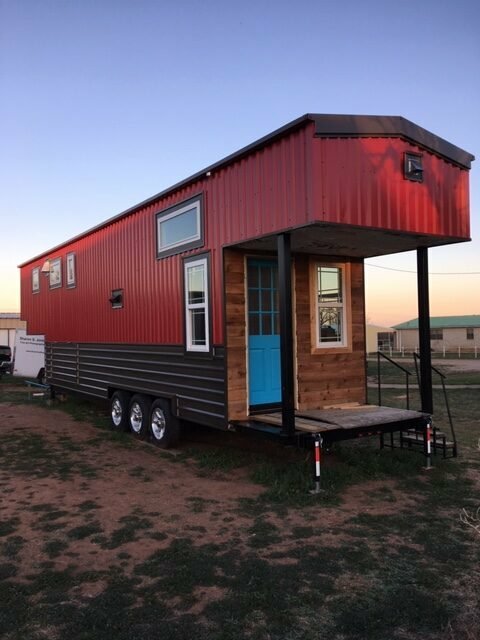 The tiny house movement inspired their project. It features a maintenance-free metal exterior and quality wood finishes planned for the interior. A robust solar electric power system will enable them to continue the boondocking lifestyle they love. 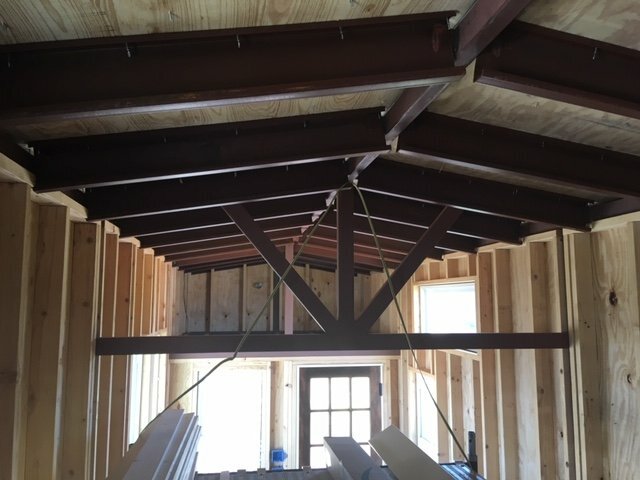 Most of the labor has been done with their own two hands, other than when a friend helped set up the steel subframe, and helped with some of the plywood sheathing and sheet metal. 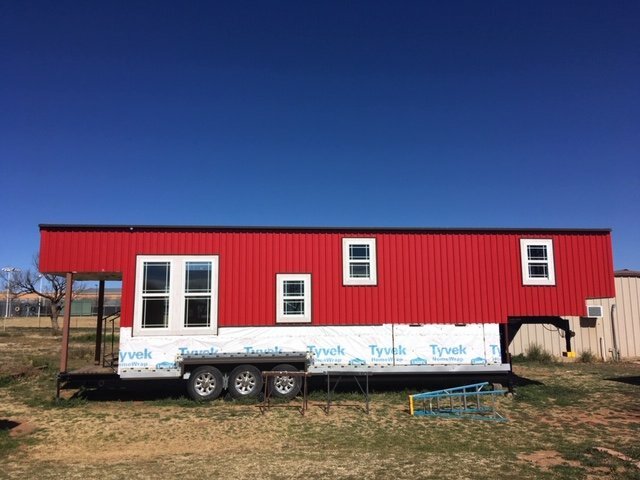 Tiny house features at a tinier price. When complete, they’ll probably invest close to $70,000 in project materials. In return, they’ll have a road-ready, full-time RV home on wheels with exceptional quality. “I realize that doesn’t include labor, but I also believe we’ll have a far superior home,” explains Brian. 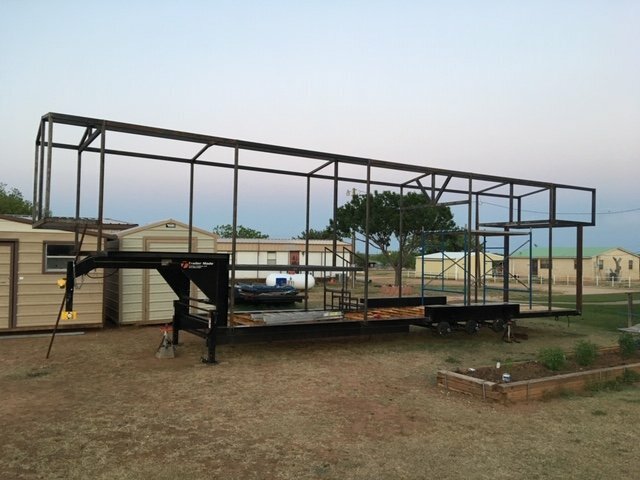 The RV’s frame and foundation is built with heavier gauge steel and better quality than a production RV frame. They expect theirs to stand the test of towing across thousands of miles over the toughest terrain. They purposely left out slide-outs, hydraulics, electric motors and other conventional RV systems, which Brian says ultimately become maintenance and repair issues neither want to deal with. Their big DIY RV is heavier than a typical production fifth wheel, but they’re happy with the trade-off. And now for the interior. Towed by a 2017 Dodge RAM 3500 4×4 dually regular cab featuring the Cummins diesel with 900 ft lbs torque, Aisin 6 speed automatic and 4:10 rear axle ratio, giving it the highest trailer load rating of approximately 31,200 lbs. Built on a purchased trailer with (3) 7,000 lb axles (total axle weight rating is 21,000 lbs) with a 30,000 lb hitch coupler. Total length will be 60’ feet. The project started in May 2018 and has taken longer than expected as they build it on a relative’s property. “It’s pretty slow with just the two of us working on it,” says the former commercial truck driver. He wants to finish by October 2019. What part of the Green Mountain State are you from? My family has been in the Lake Bomoseen area since the late 1700’s. Looking forward to seeing inside, love exterior! At 60′, will you need special permit to travel off the Interstates? It’s no longer than other production fifth wheels connected to a tow vehicle. So, nothing special required as far as length. Unless I’m missing something, I’d be nervous about the total weight. Let’s say the dry weight comes in at 18000#. Add 1660# of fresh water. That totals 19660#, leaving only 1340# for cargo with a 21000# axle rating. That’s not much considering you will be full timing. The axle rating is just that. About 25% of the trailer weight will be on the pin and carried by the truck. That shows I’m getting old; I plum forgot about that.